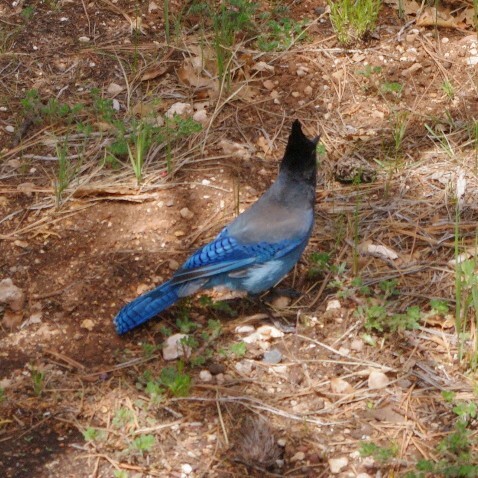 A really blue Bluejay with a tall black crest? The critters here are all pretty casual around humans. 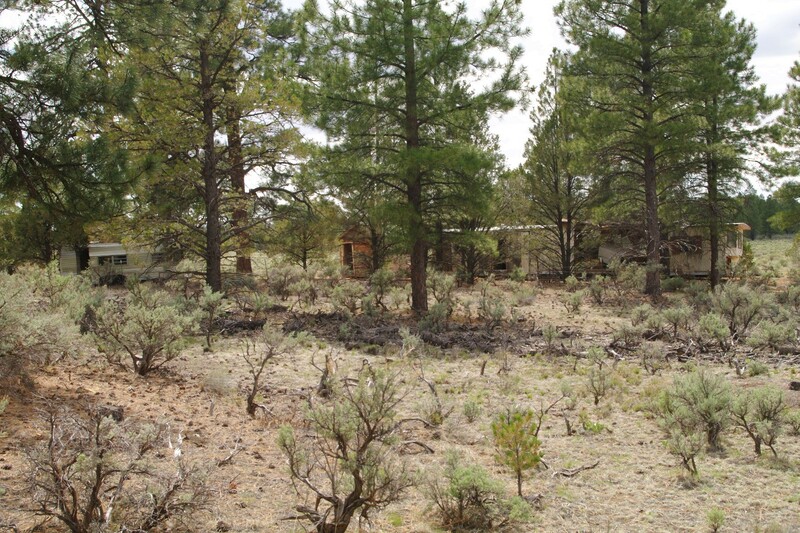 The correction is that the sole RV Park in Tusayan may restrict dump station water usage to 10 gallons of potable freshwater – and that’s to camp residents. My advice is, if you’re going to boondock in the Tusayan area, use your pass to enter the Grand Canyon National Park and head for Mather Campground for their free dump station. Their coin-op laundry has a money changer and what looked to be 20 machines at $1.75 a pop. There are coin-op showers at $2 for 8 minutes, and the boon here is that they are inside the heated laundry building – a significant benefit at the moment. Temps will be in the 50s for the next few days and nightly lows in the 20s. In fact, two nights from now, the low is forecast to be 23 degrees, which combined with a 20 MPH wind should make things interesting. I’ve been fortunate in that actual temps outside the Defiant have been 4-8 degrees warmer than forecast each night so far. I suspect that the time spent below freezing won’t phase the trailer’s plumbing, especially since I’ll need to keep the propane heater percolating all night in order to keep my breathing air above my tolerance of 45. Outside though, the freshwater fill hose in the truck bed does tend to freeze up and clog quickly in near-freezing air. I don’t expect to need to fill the camper’s tank before this cold wave passes, but I don’t want the expanding water to damage anything, either. That would put the Tankmin out of service. The forecast for tonight is 30 (which is safe), so as a test, I’ve thrown the camper’s remote thermometer sender on top of the hose under the tonneau, so I’ll be able to compare true outside temp with that near the hose. If it looks like 23 may be a threat, I’ll have to disconnect the hose at the Tankmin and empty it. I’d like to avoid that if possible, since that involves unloading much of the truck bed to get the needed access. The exposed waste pipes and valves under the RV are a concern too, but I’m hoping the the large diameter piping will slow down freezing and discourage expansion. 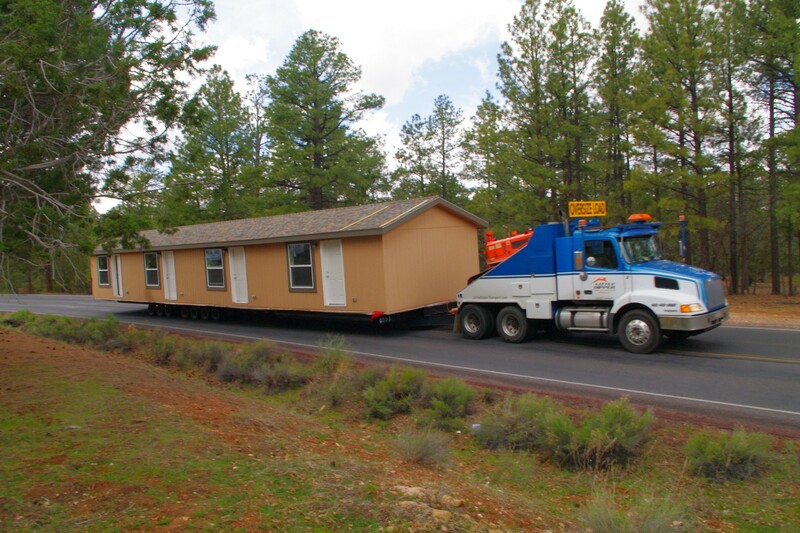 This wide load coming into the Park required a couple of highway patrol cars to block intersections and keep the roadway clear. Sanidumps, a dumpsite locator that is similar to the database on the sanidumps.com website. The advantage of the app is that it has your location and can quickly list out locations, distances from you, and show them on a map. For RVers with tanks, this is a handy thing. I’ve been pre-planning locations before trips, but this potentially cuts that effort down when timing goes awry. I cannot tow with full waste tanks because it overloads (and has bent) the frame, making the Tankmin in the truck bed all the more vital. This app just eases some of the concern on trips. Ba-WHOOSH! As a side note, I’ve found that some RVers are apparently still using harmful forms of waste tank additives in an effort to cut odor and “sanitize” their waste tanks. Some even concoct home brews with bleach and/or formaldehyde, the goal being to kill off all the bacteria in the tank. Do this with a septic system, and it both damages the piping and destroys the septic system in one shot. Since those horrid bacteria are actually needed to break down the waste, this is counterproductive and has prompted many dumpsite operators to end the tremendous expense, and close their sites. Today, there are a lot fewer dumps than there once were, and a few of the survivors now ask campers what chemicals they add to their tanks before allowing them to use their facility. Naturally, some of the recalcitrants view this as an invasion of privacy, and feel that they have the right to tip in whatever they want as their God-given choice, as American citizens. Given that they do not volunteer to fund the dumpsites back into service, this is not a good thing. And, given that the only way odor gets into the RV from the tank is from defective venting, a leaky bowl valve or poorly flushing the bowl, it makes for a poor attitude to “solve” the problem by sabotaging the operator’s system. The better way is to fix the bad mechanicals and, if you feel it’s needed, use additives that speed up the bacterial action instead of destroying it. It’s common procedure to sanitize the freshwater tank before putting it back into service after storage. Once in regular use, no further clean-up is needed. Only a very small amount of bleach is needed to do this, and going overboard to speed up the process will embrittle the RV’s piping and lead to eventual leaks. Sabotaging one’s own system is a choice, but doing the same to someone else’s is not nice, is it? Just across a private property line, three abandoned travel trailers next to a couple of tiny wood shacks made for an unusual sight. The next app I found very useful is The Ultimate US Campground Project. Once I put this on my iPhone today, I spotted several of very decent National Forest campsites around Tusayan, all of them free. As usual, most were for small rigs, but there were a few that would have been a lot less bouncy to get to than mine, and a couple even afforded more sunlight through the surrounding trees. Yaahg! Caution is still needed to avoid getting trapped in a big rig, but a quick run through with the Ford today showed that many were available beside a main trail, without having to dive down into anything claustrophobic. While doing my little exploration after doing laundry, I pulled over when a small Toyota pickup overtook me on an otherwise very lonely trail. The couple stopped to ask about finding a place they could tent camp close to the Park, and since nothing they’d seen here thrilled them, I steered them toward what the app had taken me through before: Long Jim Loop Road, a pleasant if potholed gravel road virtually peppered with nice sites, a few even large enough for the Mighty Defiant. Not all were level, and some required a tail-dragging dive down and up to get to, but few folks try to boondock remote with a 26-foot boulevard travel trailer. And that’s immediately west of town and a mile or so short of the Park’s entrance. If I didn’t need to go through the ordeal of stowing solar panels, I’d move! On a sad note, the Grand Canyon News, which I picked up to read while the washing machine churned, announced that a 29-year-old man visiting the South Rim with family, fell off the rim and down some 400 feet. Yes, you can do this. You can leave the railings and sidewalks to get a thrill if you like. But like drawing on my suburban-honed wilderness survival skills and situational awareness, one can take risks with the sense that there is some protective aura that will save you from reality. Last year, I watched a young lady cut a path along the rim edge that made me look away out of instinct, so that if she took a misstep, I wouldn’t have that memory burned into my quiet hours for the rest of my life. I’m still working on a commuter who wasn’t paying attention and bounced off the front of a speeding locomotive about five feet from me. That’s enough for me. (He lived.) At any rate, owing to the difficult location of the body, the terrain and the time of day, this young man’s body could not be recovered until the next day. The investigation is still ongoing. I jump to the conclusion that it was an accident. That’s how I roll. Many folks feel that taking risks makes them feel alive and appreciate living more, and that’s okay. It works for them. It is not universal, however it may be painted. Me, I’m unadventurous when it comes to taking impulsive risks. I did enough crazy and/or stupid things as a youth, and I can feed off those memories if I care to remind myself of poor preparation, bad luck or questionable decisions, and making it in spite of them. I’m the sort who has come to decline physical risk in order to appreciate living more. I came to take this pretty seriously while I was the sole income source for my family. Now I’m old, yet lacking in sprains, broken bones, an injured back or destroyed knees. For the most part, those were not the kinds of risks or challenges that I felt were most worthwhile for me. Despite that lack of smash-factor, I feel very much alive, especially now. In an interview, Lucy Baines Johnson once said, “Getting old is not for the faint of heart. It takes an extraordinary stamina to do it with exceptional grace…” I admit, I’ll never be able to hack that. My stamina is what wore out from overuse, and the grace…well, that’s never exactly been in me just waiting to bloom. But even aging badly is the better option than not having the opportunity to age at all, as the Grand Canyon News documented. That will not make a good campfire story years from now. Those depend on succeeding, and many do not. It’s often urged, “Live as if this were your last day!” This is good advice, to a point. That’s because it can be either an inspiration to focus on what’s important, or an excuse for uncaring self-centeredness. You won’t get the same reaction from both a loving mother and a Hell’s Angel as to how that “last day” will go. I tend to add to it, “Live as if your life matters, because it does, both to you and to those who need to lean some aspect of their lives upon you.” Life is a gift. Take life seriously, and in your enjoyment of it, you’ll find it much richer and deeper than a series of thrills. It is there for the taking, but will not always be. Almost indistinguishable from the Defiant, isn’t it, Scott? Between the shacks and the trailers, I’m not sure just what the original plan was. Was that the $3.99 campground app by Toad Hall Enterprises? Nope, Bill, this one’s by William Modesitt at the same price. I looked for it at the iTunes App store, since I have an iPhone. I can’t yet vouch for it at other locations, but it’s a winner around Tusayan. You are right that there are a lot of people out there who see those words as “do what you want regardless of the consequences.” I am on your side of the fence when it comes to taking extreme chances. I have never understood why people would take such foolhardy risks. Life, all by itself, presents enough of a challenge for me. However, I do believe that you need to take each day and enjoy it to its fullest. To appreciate the moment that you’re in, regardless of your situation, and no matter where you’re at in life. To find the joy in a cloud passing by or the beauty of a butterfly. To take that moment to appreciate the skill and grace of the hummingbird that’s hovering nearby. You’re right, Rachel. I’m often too preoccupied to appreciate the moment. Working on that! 🙂 I don’t know anyone who is able to live totally in the moment! Then too there are some moments that I don’t care to live in and certainly do not wish to repeat. I just know that My life is so much better when I choose to seethe beauty in each moment.